An easy flowcharting software will save lots of time. 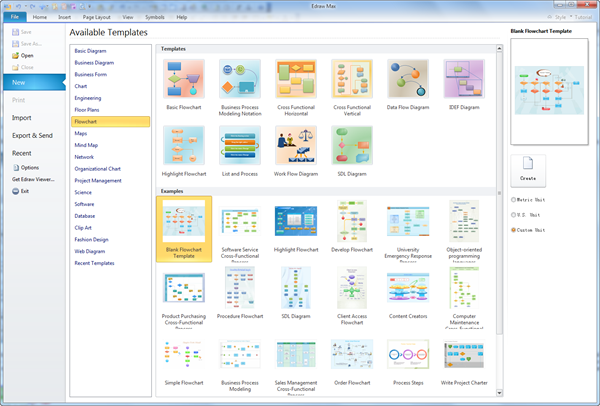 Edraw flowcharting software provides lots of free examples, templates and tutorials! Basic flowcharting helps to clarify how things are currently working and how they can be improved. Basic flowchartings are generally drawn in the early stages of formulating computer solutions. Flowcharting is a diagrammatic representation that illustrates the sequence of operations to be performed to get the solution of a problem. Flowcharts are generally drawn in the early stages of formulating computer solutions. A warehouse flowcharting is a diagrammatic representation that illustrates the sequence of operations to be performed to get the solution of a problem in a warehouse process. A work flow charting helps to clarify how things are currently working and how they can be improved. Show the relationship between a business process and the organizational or functional units, such as departments, which are responsible for steps in that process. Flowchart software is an important tool for the improvement of processes. By providing a graphical representation, they help project teams to identify the different elements of a process and understand the interrelationships among the various steps. Flow charts may also be used to gather information and data about a process as an aid to decision making or performance evaluation. For example, the owner of a small advertising agency who hopes to reduce the time involved in creating a print ad may use a flow chart of the process to identify and eliminate unnecessary steps. Though flow charts are relatively old design tools, they remain popular among computer programmers working on system analysis and design. In recent years, many software programs have been developed to assist business people in creating flow charts. Edraw flowcharting software is capable of depicting many of an enterprise's operations - and being far more efficient and productive than the conventional back-of-the-envelope approach to drawing process flows. For this reason, it is primarily used by enterprises, typically an industrial engineer or quality manager, starting an ERP implementation or BPR effort, or those documenting business processes for ISO or QS certification. Often, the software can also generate a "process narrative", a description of the processes in prose for those people who do better with words than with pictures. This is a highly user-friendly flow charting software perfect for streamlining your workflow. There are several approaches to modeling business processes. The standard approach uses the Integrated Computer Aided Manufacturing (ICAM) DEFinition methodology (IDEF), which is an activity modeling approach that decomposes activities in a hierarchical manner. While flowcharts provide a static view of the enterprise, simulation provides the dynamic view. Simulation, says Owen, can help people prove that the process they're putting in place is better than the process they're replacing. Simulation helps identify bottlenecks and redundancies, shows where processes don't work, and points to where capital costs and resources are being applied. It also lets users reengineer their processes in silicon before the expense of instituting process changes in the organization itself. When activity-based costing analysis is included in the simulation, users have a tool with some metric that justifies reorganizing the business. These simulation tools don't work in a vacuum. The basic data for Symix's Virtual Planning, for example, comes from the SyteLine ERP system. These data include workcenter descriptions, capacities, flow rates, cycle times, queue times, and start and end dates. As necessary, users can change the flow of business processes by interacting directly with the graphical representation of that flow. For instance, they can add new workcenters, drag a workcenter from one spot to another, redirect the flow of material, activate and deactivate machines, duplicate machines, resequence processes, and add more resources, whether machines or people. At the very least, the simulation will show the flow of material and information so users can identify bottlenecks. Granted, a piece of paper can show material, data, and work flows; a spreadsheet can crunch the numbers to show the ramifications of process changes. However, today's easy-to-use graphical business simulation packages are far more interactive, immediate, and often more capable of letting users perform sophisticated business process--and shop floor--analysis and tuning. Download a free business process reengineering diagram software that best suits you. Business simulation software is typically used by an industrial engineer who's up to speed on the business process flows, speeds, resources (people and machines), and such things within the enterprise. The software packages themselves can cost several thousand dollars, even six figures when adding up all the per-seat costs.